Parents of toddlers and preschoolers are often astonished at the things their kids can do. Their brains are truly like sponges, soaking up their environment, and then mimicking the behaviors around them. The human brain is at its most plastic from birth to 5 years, and the quantum leaps in learning that children demonstrate during this period are humbling to behold. However, as many as 1 in 5 kids have a very different experience when they enter school. When introduced to the written word, it may seem as if their brain has suddenly developed a charley-horse, cramped and frozen rather than flexible and malleable. Thus begins the paradoxical life of dyslexics. They may be bright, even brilliant, at some forms of learning and problem solving, yet unable to read well. 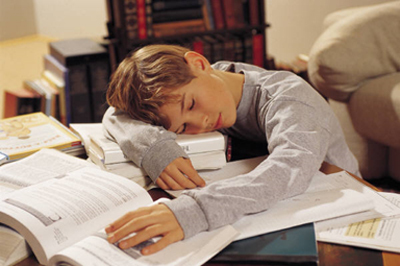 Reading is a work-intensive and often exhausting process for them. 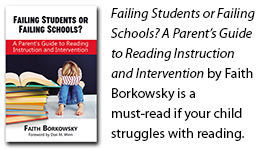 Concerned parents can be stymied by this disparity—how can the child who has always seemed so bright and intuitive possibly be having this much trouble to learn to read? Their intelligence is indisputable, so where’s the disconnect? For answers, we turn to the Yale center for Dyslexia and Creativity. Sally E. Shaywitz, M.D., co-director of the program, helps us understand how this can occur. And here’s the disparity: in typical readers IQ and reading ability not only remain on parallel tracks, but influence each other over time. As the one grows, so does the other. 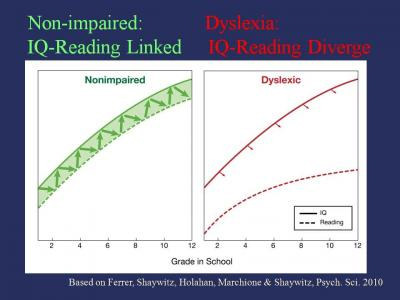 But in people with dyslexia, IQ and reading are not linked and do not influence each other. This discrepancy between reading and IQ was found after a study called the Connecticut Longitudinal Study, where students were tested during all 12 years of their time in school. “A key characteristic of dyslexia is that the unexpected difficulty refers to a disparity within the person rather than, for example, a relative weakness compared to the general population,” said co-author Bennett A. Shaywitz, M.D., the Charles and Helen Schwab Professor in Dyslexia and Learning Development and co-director of the Yale Center for Dyslexia and Creativity. Imagine seeing every word, each time you attempt to read, as if you’ve never seen the word before. Those of us with dyslexia have to read slowly, re-read, and use colored markers so we don’t lose our place. We take longer to retrieve words when reading and sometimes even when speaking, and can seem less fluid at these tasks than our peers. The pop-quiz/standardized testing environment only contributes to a student’s anxiety, and can worsen the difficulties. Take-away thought: If your child is dyslexic, they have a language-processing problem, not an intelligence problem. And that is a very different distinction that requires a very different plan of action.